Alan started Cape Hatteras Marine in 1999 and began manufacturing his line of personalized boating products for West Marine, Overton’s, Defender Industries and a slew of other retailers across the country. He helped develop one of the first online embroidery design tools enabling customers an easy way to design their custom mats, fender covers and personalized clothing & apparel. Alan also saw the need for high quality boating products and accessories that actually work! He is continually adding unique boating products from across the globe to his site which meet his exacting requirements. You can meet and chat with Alan at many of the major boat shows across the country or at the company headquarters in Costa Mesa, California. 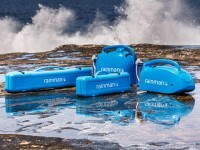 Brokers, dealers and prospective vendors interested in selling Rainman watermakers should give him a call.